Pursuant to the accepting the the Asycuda World End User License Agreement (AW-EULA), I hereby apply for a user account of Asycuda World and to this effect I/We certify that the information being provided is true and accurate. I/We confirm that a qualified IT person is available to perform any software installation(s) or hardware upgrade(s) required to operate the Asycuda World Application Software. The License terms are an agreement between Customs and Excise Division and the User of the Asycuda World Application Software. They apply to the software names above. The terms also apply to any software updates, supplements, internet base services of support services for this software. By using the software or signing this application form, you accept these terms. As described below, using the software also operates as your consent to the transmission of certain information during usage and for internet-based services. 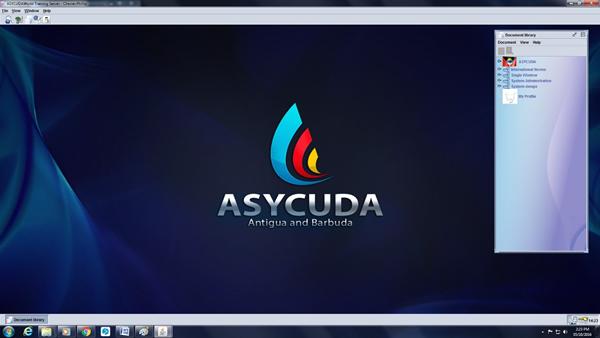 Customs and Excise provides Internet-based services with the Asycuda World Application Software. IT may change or cancel them at anytime. Cease to employ all or any registered user nominated in the application form. Change of any field in section two (2) of section (3) of the application form. Cease to conduct business with Customs and Excise Division, of Antigua and Barbuda. of a unique identifier allocated to you or persons listed in this application or to any other matters related to and the use of Asycuda World. .
Request for password reset will be done using registered email account or in person using proper ID. All sections of this application form must be completed where applicable and all questions answered. If the applicant is a company, this form must be signed by the General Manager or another authorized senior executive, and duly include the official company stamp/seal. Regardless of individual responsibilities, the person signing this form on behalf of a company shall also be responsible for the requirements/conditions set out for individuals listed in this application. and any other reasonable conditions that may be imposed by the Comptroller of Customs in respect of the registration.